BAC will generate over $18bn of CET1 capital in 2015 but buyback less than $3bn of stock; beyond dividends, the balance of $15bn has been absorbed by a $170bn increase in risk assets due to changes in regulatory accounting as BAC prepares to adopt the “advanced” approach to capital adequacy. Without these methodological issues, risk assets would have declined $20bn over the last 6 quarters with de-risking and optimization of the balance-sheet. Fortunately, BAC exited “parallel” run (during which regulators monitor internal risk models and propose changes in preparation for adoption of the advanced approach) in the last quarter and the goalposts should now be fixed. 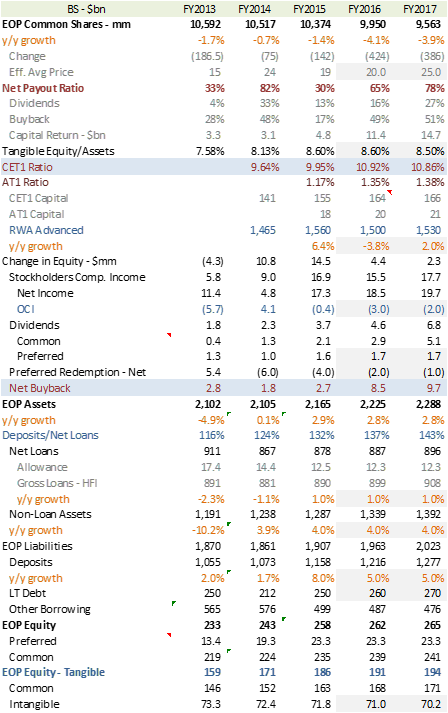 BAC will likely add ~$10bn of core capital in 2016 to bring its CET1 ratio back to the near-11% of this quarter (before pro-forma adjustment for the advanced approach) leaving ~$8bn for net buyback increasing to $10bn in 2017 as leverage stabilizes. These estimates allow for both a meaningful increase in dividend, as well as mark-to-market losses on the securities portfolio as long rates back-up, and drive a 4% reduction in stock count in each of 2016 and 2017 (compared with <1% year-to-date). This reduction in share count, along with more constructive assumptions for expenses, puts us a dime above 2017 EPS consensus of $1.75. On expenses, consensus appears (under reasonable credit assumptions) to model the core efficiency ratio reaching 59% in 2016 (corresponding to an expense run-rate of $13bn/quarter in line with 2015) before stabilizing in 2017; in contrast, we expect positive operating leverage in 2017 to drive the ratio down further to 57% with core expense growth at 2% on revenue growth near 5%. Consequently, we expect BAC to generate an ROTCE of 11%+ in 2017 consistent with a multiple of 1.3x end-2016 tangible book value forecast at $16.9/share, and hence a valuation of $22. Along with C, BAC is our preferred name among the large-cap banks (see Chart). The promise of BAC, particularly when trading near tangible book value (currently $15.5/share), is the prospect of stock buyback. With legal expenses running at a more “normal” level ($1bn in 2015 versus $16bn+ in 2014), the firm is highly capital-generative mustering nearly $18bn of regulatory capital in 2015 (comfortably exceeding income, despite a likely OCI loss, because of DTA benefits). However, BAC will return less than $5bn to common stockholders which, given the dividend, translates to a net buyback of below $3bn and a paltry reduction in the stock count (<1% year-to-date). The problem is an increase in risk-weighted assets because of changes in regulatory computation as BAC adopts the “advanced” approaches methodology. Over the last six quarters, this accounting has added $170bn of RWA (for operating risk and wholesale credit) more than offsetting the $20bn reduction in RWA that BAC has achieved through economically de-risking the balance sheet. The net increase in RWA of $150bn (from $1,410bn in FQ32014 to expected $1,560bn at end-2015) has absorbed ~$15bn of capital given we expect BAC to exit the year with a 10% CET1 ratio. With BAC having confirmed its exit from “parallel run”, when regulators monitor internal bank risk models and request changes as prelude to “advanced-approaches” adoption, the goalposts will stop moving bringing visibility to the capital plan. (We assume that BAC’s resubmission, following the qualitative concerns around revenue-modeling under CCAR stress tests, is satisfactory and the 2016 submission is unconditionally approved). With these assumptions, our model suggests a net stock buyback of $8bn in 2016 and $10bn in 2017 reducing the stock count by 4% in each year even assuming the stock price rises to $25 in 2017 (see Exhibit 1). We note that 1.3x end-2016 tangible book value of $16.9/share generates a price of $22, and the multiple is consistent with the projected tangible ROE of 11%+ in 2017. The level and timing of buybacks are sensitive to the capital glide-path: we assume management lifts the CET1 ratio to near 11% by end-2016 (to generate a 100bps buffer over the minimum requirement of 10% and allow headroom under CCAR stress tests) and holds it at that level through 2017. We further assume balance-sheet optimization reduces RWA by $60bn in 2016 with an increase of $30bn (in line with loan growth) in 2017 as this optimization runs its course. The headline result is that the net payout ratio increases from 30% in 2015 to 65% in 2016 and near 80% in 2017. We are allowing for OCI losses of $3bn and $2bn in 2016 and 2017 respectively and more adverse outcomes could hold the payout below these estimates; however, BAC has capacity to issue more preferred stock than assumed given guidance is to raise additional tier 1 capital to 1.5% of RWA from the current 1.2% and 1.4% by end-2017 in our model. 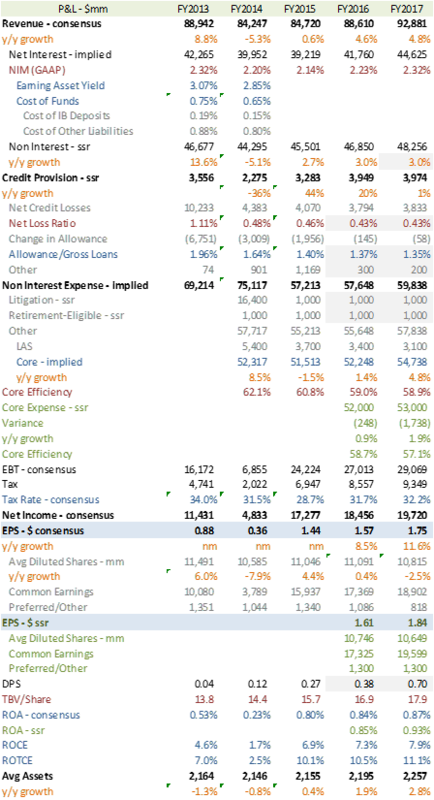 This 4% annual reduction in share count, along with more aggressive assumptions for an improvement in the core efficiency ratio, put us a dime above 2017 EPS consensus of $1.75 and we also expect positive revision to 2016 numbers. On expenses, consensus appears to model the core efficiency ratio reaching 59% in 2016 (corresponding to an expense run-rate of $13bn/quarter) before stabilizing in 2017; as revenue growth rises to 5%, we expect operating leverage to drive the ratio down further to 57% in 2017 with core expense growth held to 2% (see Exhibit 2). We are in line with revenue-consensus but note that, because of FAS91 effects, BAC’s net interest margin is more sensitive to long rates than that of peers creating more potential for upside surprise.